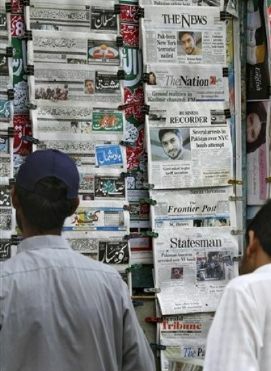 According to the latest edition of the trivia book Top 10 of Everything 2011 by Russell Ash, Pakistan has the 10th highest newspaper circulation in the world! We may not think of ourselves as newspaper reading people, but seems like newspapers do sell! There are several interesting records in the book, but the one that caught my attention was the top 10 list of countries with the highest circulation of newspapers. I’ve always heard that newspaper circulation has been pathetic in Pakistan but the numbers quoted in this book and taken from surveys of UNESCO put Pakistan at number 10 in the world in terms of the highest circulation of newspapers. Following is the list of Top 10 countries with highest newspaper circulation. The numbers written infront of country names give the average daily circulation of newspapers in these countries according to the cited UNESCO numbers. I want to bring to our reader’s attention this photo by Raja Islam posted at Karachi Metroblog. It shows how English newspaper is sold at a higher return than Urdu newspaper as packing material.